The Fiido D3 features a 52-tooth large chain and a 12-tooth flywheel, equipped with an electric assisted three-speed shifting for different road conditions. This car has a built-in large-capacity battery design, the body is simple, and the lines are beautiful, and the body can be folded in half. 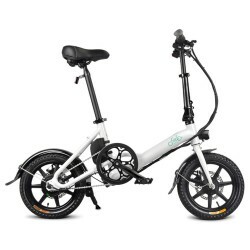 It has pure electric, riding, electric assist three riding modes. Pure electric and assist mode switch automatic induction, when the throttle is turned, it is automatically electric mode; without the throttle, stepping on the pedal is the electric assist mode. According to the rider&apos;s weight and environment, the road conditions may have a bias: The first speed of a gear is about 10km/h; The second gear assist speed is about 15km/h; The third gear speed is about 20km/h. Shockproof inflatable tires with wear-resistant and anti-slip texture, the brakes are more stable and effective, ensure your a more comfortable riding experience in different road conditions. The 250W motor can offer 25km/h max speed and 30-degree steep slopes. Electric motorcycle range up to 25-40km. Using brushless and toothed motor, the power consumption is lower, the endurance is 20% stronger than the normal brushless and toothless motor, and the starting torque is larger. The body is made of high-strength aluminum alloy, light, no rust. Lightweight and tough aluminum alloy frame has 120kg payload. Adjustable saddle tube 75-105cm, adjustable handlebar 95-110cm. It features an ultra-bright headlight for added safety in night riding. Red taillights flash distinctly while braking as a warning to other pedestrians and vehicles on the road.